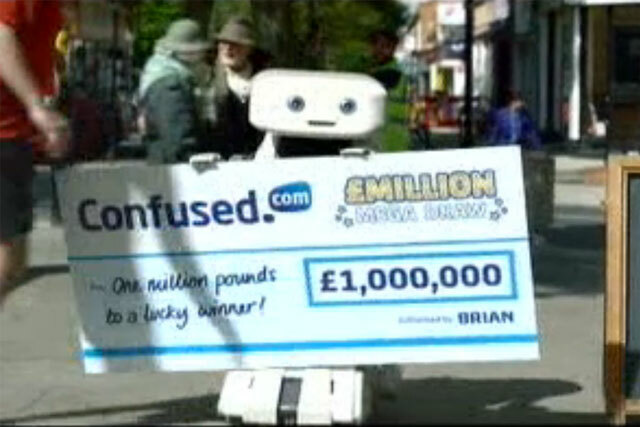 Confused.com's Brian the Robot is touring the UK to give £1 million to a lucky consumer in this week's most-recalled ad. The ad bests spots from big names like Lynx, Marks & Spencer and BT Broadband. JML's footcare product, the PediSpin, is also featured in the chart. Adwatch research was conducted from 17 to 21 July 2014 by TNS as part of its twice-weekly OnLineBus omnibus among 1000 adults aged 16-64. For details of the survey, contact Anita.Emery@tnsglobal.com (020 7656 5900). Ads were compiled by Ebiquity (020 7650 9700) and Mediaedge:cia UK (020 7803 2000).